We’re back with battles brewing in the pages of Hellblazer! This week, Constantine faces the Family Man, the Smelly Man, and the Neil Gaiman! 4:02 – Confirmed: Daniel Vozzo did the original colors for this issue. 7:41 – Of course, the cabbie’s line was written – and described as such – by Neil Gaiman, a horror writer. 13:16 – Sean is making a reference to Guilty Gear, our favorite bizarre 2D fighting game franchise. 16:40 – David Bowie also co-wrote most of the songs on The Idiot and played several instruments. In fact, his influence was such that Iggy Pop fans have criticized the record as a departure from his usual sound. 18:28 – We covered the Swamp Thing crossover here. 20:36 – This witticism refers back to Anthea’s earlier comment (unvoiced by us) that she wanted her baby to inherit John’s blond hair. 25:58 – This CBR article offers an alternative explanation: that John is able to forge a connection with Jacko because he, too, is desperately lonely. 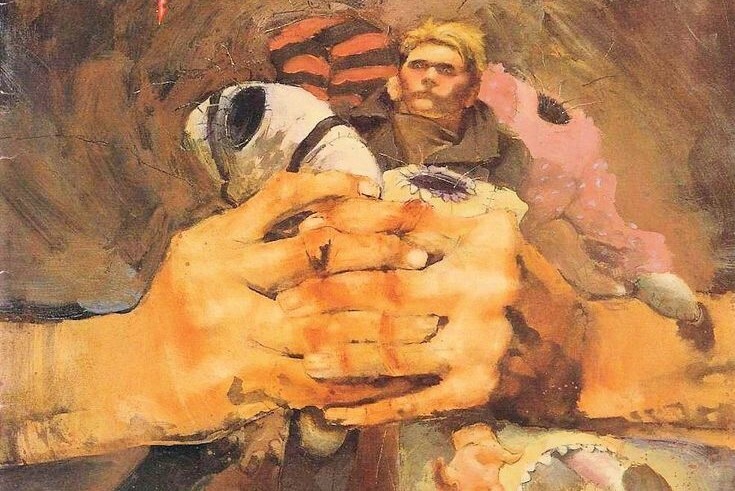 30:31 – Way back in the early days of the podcast, we covered Sandman #3 here. 41:06 – One more flashback: our coverage of Hellblazer #16 can be found here. This site uses Google Analytics. Click here to find out how Google uses data when you use our site.